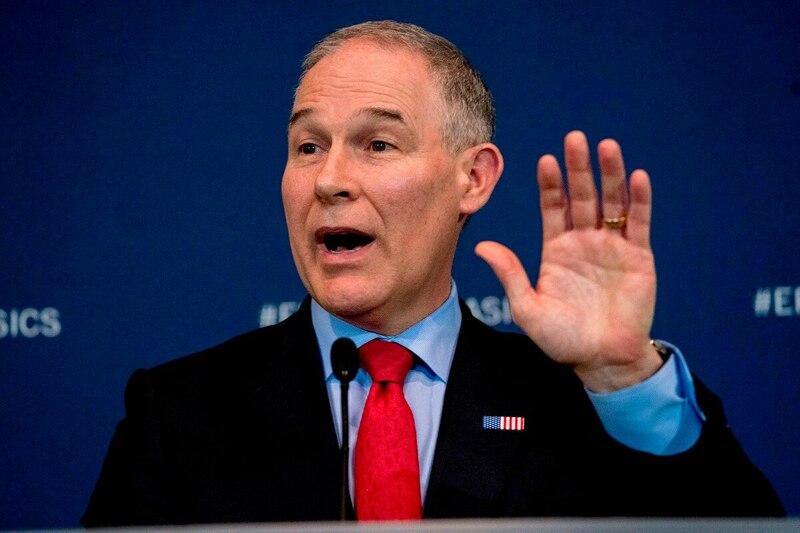 WASHINGTON — An internal government watchdog says the Environmental Protection Agency violated federal spending laws when purchasing a $43,000 soundproof privacy booth for Administrator Scott Pruitt to make private phone calls in his office. The Government Accountability Office issued its findings Monday in a letter to Senate Democrats who had requested a review of Pruitt’s spending. GAO General Counsel Thomas Armstrong determined that EPA’s purchase of the booth violated federal law prohibiting agencies from spending more than $5,000 for redecorating, furnishings or other improvements to the offices of presidential appointees without informing Congress. Because EPA used federal money in a manner specifically prohibited by law, Armstrong said the agency also violated the Antideficiency Act, and is legally obligated to report that violation to Congress. The Associated Press first reported in December that EPA also spent about $9,000 for an outside contractor to sweep Pruitt’s office for secret listening devices and installed biometric locks. Pruitt and those around him are under multiple investigations launched by government watchdogs and congressional committees. EPA’s inspector general has at least five ongoing Pruitt-related probes, while the House oversight panel on Friday demanded interviews with five of the EPA administrator’s closest aides. Among the issues being probed by EPA’s inspector general is whether Pruitt’s office properly used authority granted to the EPA administrator under the Safe Drinking Water Act to hire and give raises to a limited number of employees. Among those who have received massive raises under that authority are two young aides to Pruitt he brought with him to EPA from Oklahoma, where he previously served as state attorney general. EPA senior legal counsel Sarah Greenwalt, 30, got a raise of nearly $57,000, bringing her salary to $164,200 a year. Scheduling director Millian Hupp, 26, saw her salary jump to $114,590, a raise of more than $28,000. In a combative Fox News interview on April 4, Pruitt insisted he didn’t approve the big raises and didn’t know who did. In an unusual management alert issued Monday, EPA’s inspector general said it had reviewed personnel documents for six employees who were hired or had received raises under the Safe Drinking Water Act since Pruitt came to the agency last year. The alert said the documents were signed in some cases by Pruitt himself, while in others EPA Chief of Staff Ryan Jackson signed “for Scott Pruitt.” Names of the employees at issue were redacted from the accompanying documents, though the raises granted to two of them appeared to match those received by Greenwalt and Hupp. Other Republicans have been more forceful in criticizing Pruitt. In a Fox News interview over the weekend, House oversight chairman Trey Gowdy said he was especially troubled by Pruitt’s use of security concerns to justify spending on premium-class airfare.